Chemical constituents that are a part of a urinalysis include: pH, protein (Dipstick, SSA, Bence-Jones), protein-to-creatinine ratio, glucose, ketones, bilirubin and heme. Knowledge of the urine pH is important in interpreting urine sediment findings. Erythrocytes, leukocytes, and casts tend to disintegrate in alkaline urine (pH > 8.0). In addition, precipitation of urine crystals in supersaturated urine is highly dependent on urine pH (e.g. struvite will precipitate in alkaline not acidic urine). The reportable range of pH by the CLINITEK Advantus Urine Chemistry Analyzer used at Cornell University is from 5.0 to >9.0, in 0.5 unit increments. The table below illustrates the reportable pH results from the CLINITEK Advantus Urine Chemistry Analyzer used at Cornell University. Diet: Diet has a marked effect on urine pH. Grazing animals (herbivores) generally have alkaline urine except for young animals on a milk diet, where urine pH is more likely to be acidic. In contrast, carnivorous animals (dogs and cats) tend to have more acidic urine than adult herbivores, except straight after eating (called the post-prandial alkaline tide, due to increased secretion of HCl into the stomach). Pathologic abnormalities of systemic acid/base balance. Pathologic abnormalities of tubular function: Failure to excrete an acid load (e.g. H+ excretion in distal tubules) or failure to absorb bicarbonate in the proximal tubules. Age of urine specimen: Over time, loss of CO2 to the air occurs, raising the urine pH. Presence of contaminant or pathogenic bacteria: Some bacteria can alter the pH of urine. Urease-positive bacteria such as Streptococcus, Ureaplasma or Proteus spp. convert urea to ammonia, which will increase pH. A persistently alkaline urine in a dog or cat should prompt testing for bacterial infection, which can precipitate stone formation due to alterations in pH (ammonium magnesium phosphate crystals are more likely to precipitate at alkaline than acidic pH, hence the use of acidifying diets to treat struvite urolithiasis). Although the kidneys play a central role in the control of acid/base metabolism, the pH of a random urine sample is not a reliable indicator of total body acid/base status. In addition, studies have shown that the dipstick measurement of urine pH can be quite inaccurate (e.g. a pH value of 7.5 can be anywhere from 7 to 8). In some conditions, impaired renal tubular function causes or perpetuates the underlying acid/base derangement. Meaningful evaluation of acid-base status generally requires blood gas analysis and consideration of clinical signs. The protein pad on the multireagent dipstick is based on the “protein error of pH indicator dyes”. Basically, the test is dependent on the ability of amino groups in proteins to bind to and alter the color of acid-base indicators, even though the pH is unchanged. The reaction is more sensitive to albumin (as it contains the most amino groups), than globulins. It is insensitive to Bence-Jones proteins or free light chains (monoclonal or polyclonal) of immunoglobulins. Generally this differential sensitivity is not a significant problem (nearly all cases of significant proteinuria involve albuminuria). The table below illustrates the reportable protein results from the CLINITEK Advantus Urine Chemistry Analyzer used at Cornell University. The urine protein results should always be interpreted in context with the urine specific gravity and pH. Normal urine contains little protein; negative to trace reactions are usual in concentrated urine (urine specific gravity > 1.025). A trace to 1+ reaction in a dilute urine (urine specific gravity < 1.015) is suggestive of significant proteinuria. A dipstick protein reaction > 2+ in concentrated or dilute urine indicates significant proteinuria. There are numerous causes of proteinuria, the most common of which are urinary tract inflammation, hematuria, and glomerular disease. False positive and negative results also occur. Note that the dipstick protein only provides a subjective measurement of the degree of proteinuria. A more accurate assessment of proteinuria is obtained with measurement of the urine protein to creatinine ratio (UP:UC, see below). Glomerular permeability to protein is affected by molecular weight, size, shape and electrical charge of molecules. It is also influenced by renal hemodynamics. In general, the renal threshold is 68,000 daltons, therefore the glomerular filtrate contains electrolytes (in a similar concentration to plasma) and low molecular weight proteins. These filtered proteins are normally taken up and catabolized by renal tubular epithelial cells, therefore altered renal tubular function can result in these proteins being retained in the urine (so-called tubular proteinuria). Alterations in the glomerular barrier from altered renal blood flow (e.g. passive venous congestion in congestive heart failure) may result in mild proteinuria (functional proteinuria), whereas glomerular disease will result in a significant and severe proteinuria, consisting mostly of albumin (pathologic glomerular proteinuria). Increased filtration of low molecular weight proteins that are in high concentration in blood (hemoglobin, myoglobin, Bence-Jones proteins) will result in a significant proteinuria as the high concentration of these proteins in the filtrate overwhelm the renal tubular resorptive capacity (overload proteinuria). Urinary or reproductive tract inflammation and hemorrhage will also result in proteinuria because of the contribution of plasma proteins (not cells) to the protein measurement (reproductive tract inflammation or hemorrhage is morel likely to influence protein values in free catch urine or urine obtained by catheterization versus that obtained by cystocentesis). False proteinuria: Due to alkaline urine with the dipstick method. Pre-renal proteinuria: Pre-renal proteinuria (also called overload or pre-glomerular proteinuria) occurs when there are large concentrations of small proteins which have molecular weights (MW) below the normal glomerular threshold, e.g. colostral proteins, Bence-Jones proteins (free light chain of immunoglobulins), hemoglobin monomers or dimers and myoglobin. These freely filtered proteins, when in excess, are not able to be completely resorbed by the renal tubules, resulting in proteinuria. A colostral proteinuria occurs in neonatal animals less than 40 hours old. Excess free light chains occur in animals with plasma cell neoplasia, including extramedullary plasmacytoma and multiple myeloma. Hemoglobinuria will occur in states of intravascular hemolysis. There should be concurrent hemoglobinemia and red urine supernatant (if there is large amounts of hemoglobin) with an anemia if there is a proteinuria due to hemoglobinuria. 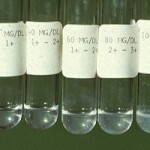 Myoglobin will leak into the urine in conditions of severe muscle injury (rhabdomyolysis). Increased values of muscle enzymes (CK, AST) will be seen in chemistry panels from affected animals, although the urine may not be discolored unless the myoglobinuria is severe. Note that both hemoglobin and myoglobin will cause a positive result for heme proteins on the dipstick, but the protein reaction on the dipstick is less sensitive to hemoglobin and myoglobin than it is to albumin. Renal proteinuria: Renal proteinuria occurs when there are alterations in glomerular permeability (glomerular proteinuria) or inability of the tubules to resorb small MW proteins which are normally filtered into the tubules through the glomerulus. Renal proteinuria also occurs when disease processes within the kidney cause leakage of serum protein into the urine, e.g. hemorrhage, inflammation. Glomerular proteinuria: Glomerular proteinuria can be functional or pathological. Functional proteinuria: results in a mild proteinuria and is due to increased hydrostatic pressure or an altered glomerular filtration coefficient, e.g. stress, exercise, fever, excitement, congestive heart failure. Pathological glomerular proteinuria: due to renal disease (e.g. renal amyloidosis, glomerulonephritis) and can be selective (resulting in loss of small MW proteins such as albumin) or non-selective (with loss of larger MW proteins, such as globulins) through the glomerulus in excess of the tubules ability to resorb them (in this case, there are no tubular abnormalities, at least initially). With glomerular disease, the proteinuria usually starts off as selective, with only albumin being lost (due to its small size). As the disease worsens, the glomerular filter barrier is further disrupted and higher MW proteins leak into the urine, resulting in a non-selective proteinuria. The dipstick result is usually 2+ or greater and excessive for the USG in pathologic glomerular proteinuria. The urine protein:creatinine ratio (UP:UC) is usually > 2 and often > 5 in dogs. This can result in hypoalbuminemia if urinary albumin loss is severe or prolonged. Tubular proteinuria: Tubular proteinuria is due to decreased renal tubule function resulting in decreased absorption of filtered low MW proteins or increased excretion/leakage of proteins by damaged tubules. This results in a mild to moderate proteinuria, i.e. dipstick readings of 2+ or less and UP:UC usually < 2 in dogs, and consists of low MW proteins with only small amounts of albumin. This does not result in hypoalbuminemia. Causes of tubular malfunction are many and varied, e.g. Fanconi syndrome, renal ischemia, nephrotoxins (such as aminoglycosides). In cases of tubular proteinuria, there is often other evidence of tubular malfunction in the urine sediment, e.g. inappropriate USG, cylindriuria, glucosuria (without hyperglycemia). Interstitial proteinuria: Occurs from hemorrhage or inflammation within the kidney. Hemorrhage/inflammation (also called post-renal proteinuria): Post-renal proteinuria is due to hemorrhage or inflammation in the urinary tract (ureter, bladder, urethra) or in the reproductive tract that causes protein (in the serum that accompanies inflammation or hemorrhage) to enter the urine once it has been formed and entered the renal pelvis. Inflammation: Inflammation and/or infection anywhere in the distal urinary or genital tracts, e.g. cystitis, prostatitis, will cause proteinuria from leakage of serum protein along with leukocytes or due to increased vascular permeability. The UP:UC is an unreliable indicator of urinary protein loss in the presence of inflammation or infection (i.e. an active urine sediment). Hemorrhage: In severe hemorrhage, the dipstick pad will be unreadable due to the urine color. Hemorrhage frequently results in proteinuria when serum protein accompanies erythrocytes. Hemorrhage can occur anywhere within the urogenital tract (including the kidney itself, although proteinuria associated with renal hemorrhage would be called renal interstitial proteinuria) but more frequently reflects lower urinary tract (bladder disorders) or reproductive tract disease. Note that traumatic microscopic hematuria associated with cytocentesis does not usually result in proteinuria. Contact time: Leaching of the citrate buffer occurs if the urine remains in contact with the pad for a long time. Detergents: Quaternary ammonium compounds and chlorhexidine can result in false positives. Bence-Jones proteinuria: A positive SSA protein reaction, with a negative or weak dipstick protein reaction, in a dog or cat with a high index of suspicion for multiple myeloma, is suggestive of the presence of free light chains in the urine. This is because the dipstick is insensitive to free light chains of immunoglobulins but the SSA will precipitate these proteins. Subjective grading of precipitation using the SSA method. Protein in urine can also be estimated using sulfosalicylic acid (SSA) precipitation. The SSA reagent is added to a small volume of urine. Acidification causes precipitation of protein in the sample (seen as increasing turbidity), which is subjectively graded as trace, 1+, 2+, 3+ or 4+. Unlike the protein test on the dipstick, the SSA reaction will detect albumin and globulins (although it is more sensitive to albumin). In addition, the SSA detects Bence-Jones proteins (which are usually not picked up by the dipstick), although it often underestimates them. In the past, the SSA reaction was used to confirm positive reactions for protein on the dipstick in alkaline urine. However, studies have shown that the SSA reaction (which is also a highly subjective assessment) is no more accurate (and in fact can be less accurate) than the dipstick for measurement of urine protein. For this reason, the SSA reaction is no longer routinely performed on urine samples at Cornell University. If there is concern that the urine protein on the dipstick is falsely increased in an alkaline urine sample, measurement of urine protein (or protein to urine creatinine ratio) on a chemistry analyzer is advised. Uncentrifuged turbid urines can look positive. Therefore, SSA should always be performed on urine supernatant. Highly buffered alkaline urine. The urine may require acidification to a pH of 7.0 before performing the SSA test. Turbid urine – may mask a positive reaction. Bence-Jones proteins are free light chains of immunoglobulins – in reality, they can be polyclonal or monoclonal, although the term usually is applied to monoclonal light chains associated with plasma cell dyscrasias (e.g. multiple myeloma). (Remember that immunoglobulins are composed of two different types of polypeptide chains, heavy and light. Heavy chains determine immunoglobulin class, whereas light chains are common amongst the classes and consist of lambda and kappa chains). Free polyclonal light chains (i.e. consisting of both lambda and kappa chains) are produced by all plasma cells. A small amount of these polyclonal light chains may be observed in urine from healthy patients and are increased if there is tubular dysfunction (free light chains have molecular weights < 44,000 daltons and are filtered by the glomeruli and catabolized by proximal renal tubule cells). In plasma cell disorders, such as multiple myeloma, free light chains may be produced in excess and are monoclonal in nature (either kappa or lambda, not both). These free monoclonal light chains are generally referred to as Bence-Jones proteins (B-J) and appear in the urine readily, because they are so small. They can be detected in urine by heat precipitation or urine electrophoresis. Bence-Jones proteins display unique solubility characteristics. As urine is heated, they precipitate at approximately 56°C. They dissolve at 100°C. When urine is cooled, they re-precipitate at 56°C. In theory, this should work quite well. However, in practice, many patients with myeloma have renal dysfunction (myeloma kidney) and have albuminuria. Albumin precipitates at 100°C and does not re-dissolve, complicating interpretation of the test. Furthermore, not all canine or feline patients have urinary B-J (approximately 10-40% of canine myeloma patients have urinary B-J). Serum and urine electrophoretograms from a cat with multiple myeloma. Bence-Jones proteins can sometimes be detected on urinary electrophoretograms, which should always be interpreted in conjunction with a serum electrophoretogram. Monoclonal B-J proteins are detected by the presence of a monoclonal peak in urine that mimics that in serum (see image below). Also, monoclonal B-J frequently migrate in the β-region of the electrophoretogram (whereas the paraprotein in serum may migrate in the β- or γ-regions). Once again, interpretation is confounded by albuminuria as a monoclonal peak in urine could represent heavy chain as well as light chain. If albuminuria is present but mild (<30 mg/dL), then the monoclonal peak in urine is likely free light chain (because the glomerular barrier is still selective in that albumin is mostly being retained in serum). In human patients, B-J proteinuria is confirmed by immunofixation using specific light chain antisera to confirm monoclonality. Unfortunately, suitable reagents are not available for veterinary patients to be able to perform this test. See total protein electrophoresis for more information. Remember that urinary dipsticks do not detect B-J proteins very well, but sulfosalicylic acid will precipitate B-J as well as other urinary proteins. Tubular function affects proteins and creatinine similarly. In reality, tubular secretion of creatinine increases as plasma creatinine concentration increases, therefore the ratio may be decreased in azotemia. For measurement of the urine protein to creatinine ratio, the protein is quantified on a chemistry analyzer, which is more accurate than using the dipstick. There are several methods for measuring urine protein (and creatinine), including dye-binding (Coomassie brilliant B, pyrogallol red-molybdate) or turbidometric (e.g. benzeth0nium chloride, trichloroacetic acid, sulfosalicylic acid) methods. We use the latter method, which incubates the sample in EDTA at an alkaline pH (to denature protein and remove magnesium ion interference per product manufacturer sheet) before addition of the benzethonium chloride in a blanked end-point reaction. Studies with dye-binding methods have shown variable coefficient of variation (CV, ranging from 6-8% for intra-assay to 10-11% for inter-assay) for urine protein measurement, with additional variability (albeit lower) for creatinine, resulting in an intra-assay CV ranging from 7-10.4% (higher for pyrogallol red-molybdate) and an inter-assay CV of 16-18% (higher for Coomassie Brilliant B) in cat urine. This variability resulted in a 10-45% altered classification rate based on IRIS staging (Giraldi et al 2018). Changes were seen in urinary creatinine with frozen storage, although the authors stated that the UPC did not change significantly (data not shown for evaluation). Differences in the UPC were seen comparing the two dye-binding methods but one was done after frozen storage. This study indicates that not all UPCs are created equal and method of protein (and creatinine analysis) will influence the results. The bottom line is that for serial testing, the same laboratory (ideally with known method) should be used and switching between laboratories may not yield equivalent results. Dogs: In healthy dogs, the urine protein to creatinine ratio (UP:UC) is usually < 0.5. Values ≥ 0.4 in azotemic dogs are abnormal. Values between 0.5-1.0 in non-azotemic dogs are considered equivocal and continued monitoring for progression is recommended. Values >1.0 in non-azotemic dogs are abnormal and diagnostic evaluation is warranted. Glomerular proteinuria is usually associated with UP:UC ≥ 2.0. Therapeutic intervention is recommended for azotemic dogs with UP:UC ≥ 0.5. These figures are only valid for urine samples with inactive sediments. Cats: In healthy cats, the urine protein to creatinine ratio is usually < 0.5. Values ≥ 0.4 in azotemic cats are abnormal. Values between 0.5-1.0 in non-azotemic cats are considered equivocal and continued monitoring for progression is recommended. Note that some healthy male cats can have UP:UC values within this range (up to 0.6). Values >1.0 in non-azotemic cats are abnormal and diagnostic evaluation is warranted. Glomerular proteinuria is usually associated with UP:UC ≥ 2.0. Therapeutic intervention is recommended for azotemic cats with UP:UC ≥ 0.4. These figures are only valid for urine samples with inactive sediments. Mild increases: Can be seen in prerenal or renal proteinuria or proteinuria that accompanies genitourinary hemorrhage or inflammation. Tubular proteinuria usually results in UP:UC of < 2.0 (range: 1.0-5.0). Moderate to severe increases: UP:UC > 2.0 (usually > 5.0) are seen with glomerular disease, e.g. glomerulonephritis or amyloidosis. The severity of proteinuria does not distinguish between causes of glomerular disease. Hemorrhage: The UP:UC will increase proportionally to the degree of blood in the urine (due to the contribution of serum protein that comes along with the blood). Heavy blood contamination with accompanying plasma protein frequently invalidates the ratio. Mild blood contamination from cystocentesis (i.e. 5-20 RBC/HPF or even > 100 RBC/HPF) does not usually cause a proteinuria (on the dipstick or with urine protein to creatinine ratios). Infection: The UP:UC is invalid in the presence of a urinary tract infection. Ratios as high as 40 can be seen with E. coli infections. The ratio does not correlate to the number of red or white cells/HPF in these cases. Some cases of urinary tract infections can have normal protein to creatinine ratios so the degree of proteinuria in these cases cannot be predicted from the degree of cystitis. Proteinuria with infection is attributed to leakage of serum protein due to inflammatory-induced changes in vascular permeability which may depend on the severity and nature of the inflammation. Inflammation: Inflammation, without infection, will increase the UP:UC, but usually the ratio is < 2.0. Therefore, urine protein-creatinine ratios should not be measured in animals with “active” urine sediments. Drugs: Immunosuppressive doses of corticosteroids (2 mg/kg q 12 h for 6 weeks) will increase the urine protein-creatinine ratio mildly (up to 1.3). This is attributed to mesangial cell proliferation. Further information is available on the Urine Protein to Creatinine Ratio test offered by the Animal Diagnostic Health Center at Cornell University. Proteinuria due to tubular injury can be distinguished from proteinuria due to glomerular injury by performing gel electrophoresis on the urine. This is done using a sodium-dodecyl-sulfate-polyacrylamide gel electrophoresis (SDS-PAGE) or SDS-agarose gel electrophoresis. The SDS imparts a uniform charge to the proteins such they migrate different lengths in an electric current based on size and not charge (unlike standard serum or urine protein electrophoresis, which is done without SDS and using an agarose or cellulose acetate gel). Normal canine urine contains a faint albumin band at around 55 kD, a faint band at 100 kD corresponding to Tamm-Horsfall protein, and 3 bands below 54 kD in intact male dogs due to proteins associated with the prostate. Tubular proteinuria is characterized by the presence of increased amounts of low molecular weight proteins, below the glomerular molecular weight cut-off in the urine (<54 kD), such as retinol binding protein (21 kD). Glomerular proteinuria is associated with increased amounts of albumin and higher molecular weight proteins. The severity of the banding can be scored subjectively (Hokamp et al 2018). In one study of dogs with chronic kidney disease and proteinuria, a tubular but not a glomerular proteinuria pattern weakly correlated with tubular injury on light or electron microscopy, including tubulointerstitial fibrosis or chronic inflammation and tubular atrophy or degeneration. In contrast, glomerular and tubular proteinuria patterns were seen with light microscopic evidence of glomerular damage and the strongest correlation was seen with a glomerular pattern and electron microscopic evidence of glomerular injury. Tubular patterns in dogs with evidence of glomerular injury may be due to co-existence of tubular and glomerular injury (absorption of excess albumin can lead to chronic interstitial nephritis or tubular injury) or overload of tubular absorptive capacities with severe glomerular proteinuria (Hokamp et al 2018). Glucose is measured on the Multistix® by a glucose oxidase method. The reaction of glucose with glucose oxidase forms nascent oxygen (O), which converts potassium iodide in the dipstick pad to iodine, forming a brown color change. Normal urinary glucose is below the level of sensitivity of the commonly used detection techniques. Therefore, glucose is an abnormal finding in urine. The table below illustrates the reportable glucose results from the CLINITEK Advantus Urine Chemistry Analyzer used at Cornell University. The presence of hydrogen peroxide, bacterial peroxidases (e.g. cystitis), hypochlorite and chlorine will produce false positive reactions. Hyperglycemia (overload hyperglycemia): In nearly all cases, glucosuria is a result of prior and often continuing hyperglycemia, to a level in excess of the renal threshold for reabsorption. The threshold in camelids is not known but is likely similar to the ruminant and horse. * Diabetic cats can have lower thresholds (200 mg/dL). Persistent hyperglycemia: Glucosuria is seen in diabetes mellitus, hyperadrenocorticism, acromegaly, and phaechromocytoma. Remember that a glucosuria may falsely increase the USG. Transient hyperglycemia: Stress-related hyperglycemia above the renal threshold has the potential to result in glucosuria. This is especially true in cats, camelid and cattle, which develop marked stress-related hyperglycemias. Thus, the finding of glucosuria is not necessarily diagnostic for diabetes mellitus (in fact diabetes mellitus is very rare in cattle and camelids). Other conditions which produce transient hyperglycemia, e.g. pancreatitis, can potentially induce a mild, transient glucosuria, if blood glucose concentrations exceed the renal threshold. Studies have also shown a postprandial hyperglycemia and glucosuria in some species (Vicari et al 2008). Abnormal proximal renal tubule function: Glucose is absorbed by a carrier-mediated process in the proximal renal tubules. Abnormal tubular function can result in glucosuria without hyperglycemia, but these conditions are quite rare. Physiologic: Young puppies (< 8 weeks old) can have mild glucosuria due to tubule immaturity. Renal tubule damage: This could be due to drugs (aminoglycosides), hypoxia, infections (Clostridium perfringens type D in sheep “pulpy kidney”) or other causes (e.g. proximal renal tubular acidosis which can be secondary to copper toxicity or idiopathic Fanconi syndrome [Cesbron et al 2017]). Inherited renal diseases: Primary renal glucosuria, Fanconi syndrome, etc. The ketone pad on the multi-reagent dip stick detects mainly acetoacetic acid and acetone (to a far lesser extent); β-hydroxybutyrate (BHB) is not detected. The ketones react with sodium nitroprusside which forms a purple color change. The color change is quite subtle, leading to many false positive reactions; this is due to the strong color of animal urine. The Cornell University Clinical Pathology Laboratory performed internal studies which have shown that most trace reactions (5 mg/dL) are false positive results. We also found that some small (15 mg/dL) to moderate (50 mg/dL) results may also be false positive reactions. Measurement of urinary β-hydroxybutyrate on our chemistry analyzer can be done to confirm any positive ketone result (this urinary test result is best interpreted concurrently with serum BHB concentrations). We also are confirming reactions that are small or larger (15 mg/dL or larger) with the Acetest®. Note that ketonuria will precede a ketonemia. By the time ketones have increased sufficiently in blood to cause a high anion gap titration acidosis, a ketonuria should be evident. The table below illustrates the reportable ketones results from the CLINITEK Advantus Urine Chemistry Analyzer used at Cornell University. This tablet test is used to verify positive reactions from the dipstick, as the color change on the dipstick can be quite subtle. The Acetest® contains lactulose which enhances the color change and the result is considered to be more accurate than the dipstick, in which false positives can occur due to the color of the urine. The Acetest® is also useful for semi-quantitatively measuring ketones in other fluids, such as plasma, serum and milk. The bilirubin pad on the multireagent dipstick detects bilirubin using a specific diazotization reaction and is sensitive to 0.2-0.4 mg/dL of conjugated bilirubin. However, the color change indicating a positive reaction is a rather subtle transition among shades of beige, and sometimes is obscured by color inherent in the urine itself (e.g., marked hemoglobinuria). In such instances, confirmation of a suspected positive reaction used to be done using a tablet version of the test, the Ictotest method, which yielded a purple color reaction which was easier to read. When there was a discrepancy between the dipstick bilirubin result and the Ictotest (e.g. small reaction on the dipstick and negative on the Ictotest®), the Ictotest® is considered the accurate result (i.e. a negative result in this example). In the experience of the Cornell Clinical Pathology Laboratory, false positive reactions for bilirubin with the dipstick were exceedingly uncommon (results of the dipstick and tablet versions of the test usually matched). The table below illustrates the reportable bilirubin results from the CLINITEK Advantus Urine Chemistry Analyzer used at Cornell University. Physiologic: Dogs have a low renal threshold for bilirubin, therefore highly concentrated urine samples from this species may have a trace to 1+ reaction. Male dogs can also conjugate bilirubin in their renal tubules (after uptake of unconjugated bilirubin from blood) so male dogs are more likely to have a bilirubinuria than female dogs. This may be clinically insignificant. The same is true of ferrets, in that healthy ferrets can have small amounts of bilirubin in their urine (Orcutt 2003). Cholestatic hepatobiliary disease: Detection of bilirubin in urine is generally an abnormal finding. Bilirubinuria generally results when conjugated bilirubin levels in blood are increased as a result of cholestatic hepatobiliary disease. In the dog, bilirubinuria (in excess for the USG) may be seen prior to bilirubinemia due to the low renal threshold for bilirubin in this species. In all other species, bilirubinuria indicates cholestasis. Intravascular hemolysis: In some cases of intravascular hemolytic anemia, bilirubinuria may be secondary to the hemolysis without any evidence of cholestasis. The renal tubular epithelium is capable of absorbing free hemoglobin from the glomerular filtrate and converting it to conjugated bilirubin, which is then excreted in the urine. This will only occur with intravascular hemolysis, when free hemoglobin is filtered by the glomerulus. However, most of the bilirubin in this scenario is due to concurrent cholestasis in affected animals. Bilirubin crystals: In some samples, bilirubin crystals may be identified in the urine (indicating bilirubinuria), however the dipstick reaction for bilirubin is negative. The reason for this is unknown, however the crystals may not solubilize sufficiently to react with the dipstick in these cases, resulting in a false negative reaction. Aged urine samples: Conjugated bilirubin hydrolyzes to unconjugated bilirubin if left at room temperature. Exposure to UV light: UV light converts bilirubin to biliverdin, resulting in false negative reactions. Ascorbic acid: High concentrations of vitamin C inhibit the reaction. The Ictotest® uses the same chemical reaction as the bilirubin pad on the multi-reagent dipstick, but is presented in a tablet format. The main advantage is that observation of the true color reaction is less affected by the inherent color of the urine itself. It is, therefore, useful in confirming or refuting apparently positive reactions on the dipstick in cases where the urine sample is deeply colored. It is also more sensitive to bilirubin than the dipstick (detects 0.1 mg/dL of bilirubin). At Cornell University, we historically used this test to confirm positive bilirubin reactions on the dipstick, this result being a more accurate assessment of urinary bilirubin. In reality, we hardly ever saw false positive bilirubin reactions with the dipstick (positive with the dipstick but negative on the Ictotest®). We did, however, occasionally see false negative reactions on the dipstick (negative on the dipstick, positive on the Ictotest®). These false negative reactions primarily occurred when bilirubin was only present in crystal form (i.e. bilirubin crystals were seen on urine sediment examination). The Ictotest® is no longer available. Internal studies at Cornell University have shown that measurement of bilirubin on our chemistry analyzer provides accurate results for bilirubin concentration in urine. Hemorrhage (hematuria): This is the most common cause of a positive reaction. The reaction for heme on the dipstick is very sensitive and will detect heme associated with as few as 10 RBC/uL. Non-heme peroxidases (false positives): Bacterial peroxidases, chemicals with peroxidase activity. We use clinical signs, other laboratory data (hemogram and clinical chemistry) and various attributes of urine (urine color, findings in urine sediment, taking into account method of urine collection) to differentiate between the three potential pathologic causes of positive heme reactions on the dipstick (hematuria, hemoglobinuria, myoglobinuria) and have given guidelines below. Usually, this can be accomplished readily, however there are occasions where we cannot readily explain a heme reaction (no RBC in the sediment, no intravascular hemolysis, no evidence of muscle injury). In such cases, it is possible that the heme reaction is a false positive due to peroxidase activity from bacteria or other chemical compounds or because the RBC that were in the urine have lysed. In rare cases, there may be more than one cause for a positive reaction for heme on the dipstick, e.g. hematuria and hemoglobinuria can occur concurrently, e.g. a dog with intravascular hemolysis and hemorrhage secondary to cystitis. In the latter cases, the heme reaction could be due to RBC from hematuria and hemoglobin from intravascular hemolysis. Similarly, an animal can have red urine with no RBC in the sediment and the heme reaction could be due to both myoglobin and hemoglobin, e.g. a horse with intravascular hemolysis secondary to oxidant injury from red maple leaf toxicity and with severe muscle injury. It becomes academic to try and determine if the red urine is due to hemoglobin or myoglobin. Both will cause renal injury from direct nephrotoxicity and hypoxic damage due to scavenging of nitric oxide (an important renal vasodilator). The guidelines given below do not permit direct distinction between hemoglobinuria and myoglobinuria (they are indirect methods of assessment). This can only be done with additional tests, e.g. electrophoresis, but is rarely required. Note that the test is called “Heme” on our urinalysis results, which reflects what the test is detecting versus “blood”. The table below illustrates the reportable heme results from the CLINITEK Advantus Urine Chemistry Analyzer used at Cornell University. There are three main causes of a positive heme reaction on a dipstick: Hematuria, hemoglobinuria and myoglobinuria. Below are ways to differentiate between these causes, including a table summary. 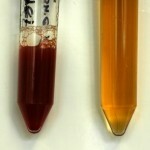 Hematuria: The dipstick is actually detecting hemoglobin within RBC, that lyse when they contact with the reagent pad. In some cases, a speckled pattern results if only some RBC are lysed when they contact the pad (called “non-hemolyzed” on the dipstick). Hematuria can be macroscopic (i.e. the urine is visibly red) or only microscopic (the urine is not visibly red, but RBC are seen in the sediment). With substantial hematuria, the urine pellet will be red (RBC precipitate) after centrifugation of the urine to examine the sediment. The urine supernatant is then usually clear (all the RBC are in the pellet) but could be red (if the RBC have lysed or there is concurrent hemoglobinuria or myoglobinuria). Again, this is the most common reason for a positive reaction for heme on a dipstick (which is why the term “blood” is likely used on some dipsticks to reflect a positive reaction for heme). Expected urine sediment findings: Intact RBC. One can attribute a positive heme reaction to hematuria if intact RBC are seen in the sediment (regardless of whether the urine is visibly red). If we see a positive reaction for heme on the dipstick and RBC in the sediment, we usually attribute the heme reaction to hematuria versus looking for another cause (hemoglobin from intravascular hemolysis or myoglobin from muscle injury). However, there are several occasions when RBC are not seen in the urine sediment despite the presence of hematuria. This could be due to lysis of RBC. With storage of urine, RBC that have entered the urine will lyse and a positive reaction for heme may occur in the absence of visible RBC in the sediment. This lysis is accelerated in urine with low specific gravity, i.e. <1.010 units, or high pH, usually ≥8.0 units. Note, that even though RBC are lysing in the urine and releasing their hemoglobin which is reacting with the dipstick, we do not use the term hemoglobinuria for these findings. Rather the term hemoglobinuria is used to indicate the hemoglobin is in urine from spill-over from free hemoglobin in plasma (from intravascular lysis of RBC in blood and not from lysis of RBC in urine). Expected hemogram and chemistry findings: No anemia (some animals may be anemic from other causes) and no hemoglobinemia; no evidence of severe muscle injury clinically or on the chemistry panel (muscle enzyme activities, e.g. CK, are not substantially increased). A positive reaction for heme on a dipstick in an anemic animal with no RBC in the urine sediment should not be used as evidence that the animal has hemoglobinuria and thus anemia due to intravascular hemolysis. The anemia in such animals can be due to multiple other causes, including suppression from inflammatory disease. Causes of hematuria: Hematuria results from bleeding into the urine and can occur at any level of the urinary or reproductive tract, i.e. indicates urogenital bleeding. However genital bleeding should only impact urine results in samples collected by free catch (voided) or catheter. Hematuria in urine samples collected by cystocentesis should reflect hemorrhage into the urinary tract (kidney, ureters, bladder). Iatrogenic hemorrhage occurs secondary to the collection procedure, i.e. cystocentesis or catheterization (only if traumatic or the urethra is already irritated or fragile). We frequently see microscopic hematuria (normal colored urine with RBC in the sediment; >100 RBC/HPF may be seen) as a consequence of cystocentesis if small vessels are damaged during the procedure. Pathologic hemorrhage occurs due to genitourinary disease, e.g. inflammation, irritation from uroliths, neoplasia (transitional cell carcinoma in prostatic urethra or bladder), and hemostatic disorders. As indicated above, hemorrhage from the reproductive tract will not usually result in hematuria in a urine sample collected by cystocentesis. Hemoglobinuria: In this case, the hemoglobin is due to “spill-over” from excess free hemoglobin in plasma (i.e. hemoglobin concentrations in plasma high enough to saturate haptoglobin, so the hemoglobin overcomes the renal threshold and spills into the urine). This only occurs with intravascular hemolysis and associated causes of anemia due to intravascular hemolysis. 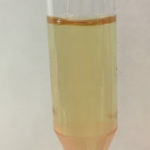 The urine (before and after centrifugation) is usually grossly red (it may be light red) and no RBC are seen in the pellet (pellet is not red) when the urine is centrifuged for sediment examination (unless there is concurrent hematuria). Note that hemoglobin will oxidize in urine and become methemoglobin, so urine containing methemoglobin will be more brown than red. Expected urine sediment findings: No RBC. Expected hemogram and chemistry findings: Anemia (decreased HCT) with evidence of hemoglobinemia (red plasma). A cause of intravascular hemolysis may be evident, e.g. oxidant injury (eccentrocytes, Heinz bodies), specific infectious agents (e.g. Babesia). Extravascular hemolysis will not result in hemoglobinuria (thus hemoglobinemia and hemoglobinuria help distinguish between intra- and extravascular hemolytic anemias). There should be no clinical or laboratory evidence of severe muscle injury (i.e. CK should not be very high). As indicated above, a positive reaction for heme on a dipstick in an anemic animal with no RBC in the urine sediment does not indicate by itself that the animal has hemoglobinuria and intravascular hemolysis. There must be additional evidence to support this (see above). Causes of hemoglobinuria: Any cause of intravascular hemolysis. Myoglobinuria: In this case, the positive reaction on the dipstick is due to “spill-over” from excess myoglobin in plasma. Myoglobin is not normally seen in plasma and is only released in high quantities with severe skeletal muscle injury (it is a large protein after all). The urine may be orange, red to brown (before centrifugation and supernatant after centrifugation) and no RBC will be seen in the pellet after centrifugation (unless the animal has concurrent hematuria). Note a brown urine color does not indicate myoglobin is in the urine. Hemoglobin rapidly oxidizes in urine and will be converted to methemoglobin, which is also brown. In humans, myoglobin is rapidly cleared (within several hours) from blood via renal clearance primarily (its molecular weight is well below the renal threshold at 16 kD) with some also being metabolized to bilirubin. Myoglobin appears in urine when concentrations in plasma are >1.5 mg/dL. A change in urine color will occur if the myoglobin is >100 mg/dL (Huerta-Alardin et al 2004). Expected urine sediment findings: No RBCs. Expected hemogram and chemistry findings: No anemia (unless animal has another cause of anemia) or hemoglobinemia (unless concurrent intravascular hemolysis). There should be clinical (stiffness, pain) and laboratory evidence of severe muscle injury (i.e. very high CK activity, e.g. >50,000 U/L, AST and LDH may be concurrently increased unless injury very acute). Causes: Severe muscle injury, usually affecting skeletal muscle (which has the largest muscle mass), e.g. exertional rhabdomyolysis in horses (“tying up”), inherited myopathies in dogs. Injury affecting smooth muscle (e.g. gastrointestinal tract) or cardiac muscle is unlikely to result in sufficient myoglobin release to cause myoglobinuria. Urine = urine before centrifugation; supernatant and pellet = after centrifugation of urine to create a urine sediment (pellet), may be = depends on extent or degree of hematuria. * Note, this refers to hemoglobinemia due to intravascular hemolysis. Artifactual in vitro hemolysis (RBC lysing in the collection tube or lysing during collection, but not lysing in in the animal) will also result in red plasma, however in vitro hemolysis will not cause hemoglobinuria (see table for differentiating between in vivo and in vitro hemolysis under mechanisms of anemia)! ** Mild muscle injury (as evidenced by a mildly increased CK activity) is not expected to result in substantial myoglobinuria. ***Animals may be anemic for other reasons (which may depend on the primary underlying disease). Also substantial or chronic blood loss from the genitourinary tract can result in a blood loss anemia (an iron deficiency anemia can also ensue from chronic blood loss once iron stores are depleted). Uric acid is formed from the catabolism of the nucleic acids, adenine and guanine. Both of these nucleic acids are converted to xanthine, guanine directly and adenine after being converted to hypoxanthine first. Xanthine is converted to uric acid via the action of xanthine oxidase. Uric acid is usually converted by hepatic uricase to allantoin, which is excreted in the urine of most dog breeds, except the Dalmation. The Dalmation has a defect in uric acid uptake into hepatocytes, resulting in decreased conversion to allantoin. Therefore, this breed excretes uric acid, and not allantoin, in the urine. The supersaturation of uric acid in the urine of Dalmations predisposes this breed to urate urolithiasis. Measurement of uric acid in urine is used to detect excessive urate excretion in breeds, such as Dalmations, and to monitor response to therapy with allopurinol. The best method for measuring urinary urate excretion is from a 24-hour urine collection. Uric acid precipitates rapidly when urine is cooled, so the sample must be resuspended and a well-mixed aliquot provided to the laboratory, to prevent falsely decreased values due to precipitation. The determination of a uric acid/creatinine ratio does not appear to be a reliable test for quantifying urinary uric acid excretion, as the values are influenced by diet.